In this case, I was communicating with staff, patients and caregivers at Henry Ford West Bloomfield Hospital, 10 miles outside of Detroit, Michigan. My work started at 9 in the morning and went until 9 at night, and involved interacting with so many different types of people with so many different stories and needs and challenges and experiences. Many of these people are dealing with life-threatening illness, which they shared one-on-one as I signed books for them. Again and again their stories exemplified the power of the human spirit to transcend some of the most difficult things we may encounter in life. What truly amazes me is the deep reservoirs that people pull from. I wondered more than once, how can this person transcend and survive and thrive when the deck is so clearly stacked against them? I was in awe. I realized there’s something about the human spirit, throughout history and time and everything else, that is really quite remarkable and way beyond intellectual understanding. I was so deeply inspired when hearing these stories, especially during tumultuous times like these. In a week where we had so much going on in our country, I was in this intense separate universe, focused on these people in these 36 hours. The stories the patients shared were remarkable and the hospital itself is unique. Built in 2009, it’s actually anything but a hospital. It’s more of a gravitational force that brings medicine, healing arts, and community together. A statement on their website captures the sense: “We want you to feel like family, whether you’re a patient or visiting a friend or loved one. We are committed to provide the amenities, support, and services you need for a comfortable, healing experience.” This, they do. Inside the building are gorgeous pavillions, cafés, and a state-of-the-art teaching kitchen, with a focus on bringing together all the best elements of Western medicine with healing through art, music, energy medicine, yoga, food… It’s really amazing! All these approaches are not just being utilized but studied. I found something incredibly inspiring about being in Michigan in this remarkable space—truly a place of healing, not just a place to go for a procedure. The whole first part of the building is full of atriums and nature, healing places for people to sit, and ponder and talk—like nothing I’ve ever seen. So special in fact that the CEO of my hospital in Marin went to visit. Henry Ford is an oasis of healing where caregivers, practitioners, and patients are dealing with very real personal stories and struggles in a creative, holistic way and where staff is truly engaged in contributing to the community. When things seem totally out of our control, which certainly many people are feeling right now in the times in which we are living, community assumes an importance that’s greater than ever. When we engage personally and directly with our community, even in the smallest way, we can feel we are doing something that matters—even when the world is spinning off on an axis we can’t even grasp. Whether you are 11, 15, 53, or 83 years old, you can be deeply touched by community. Seeing people bringing a little slice of thoughtfulness, intention, and kindness to other people helps us feel empowered by hope, untouched by the 24/7 news cycle. The fabric of life is the stitching together of all our stories and our support for each other. We’re not often privy to that unless we’re engaged in our community person-to-person, experiencing that very real, awe-inspiring connection with people. Listening to hospital staff and patients telling their stories in this beautiful healing space was so powerful. Also I was struck by noticing the art on the walls of the hospital that is very intentional. In a place where people are getting ready for surgery is an amazing mural done by a Michigan artist of a lake scene. Michigan folks are very proud of their lakes, and the water is very calming. People can take a deep breath. And the food! All their soups are homemade and they were offering 5 different kinds of healing broths! The chefs take such pride in the healing power of their food. I just landed and paused briefly there, yet even in that short intense time I experienced the flavor of the special healing brew that is taking place. I left feeling immensely hopeful. All the broths can be enjoyed fresh and frozen to have on hand. This is my most famous recipe, a broth that can be transformed to meet a myriad needs, from an immune-boosting sipping tea to a delicious, nutritious stock for hearty soups and stews. This rejuvenating liquid, chock-full of magnesium, potassium, and sodium, allows the body to refresh and restore itself—the perfect healing touch for your community of family, friends, and neighbors. If broth could be compared to wine, I’d describe this hearty beef bone broth as the equivalent of a big Cabernet. Go for grass-fed beef here since it has the best nutritional and taste profile, then include all sorts of vegetables and herbs. 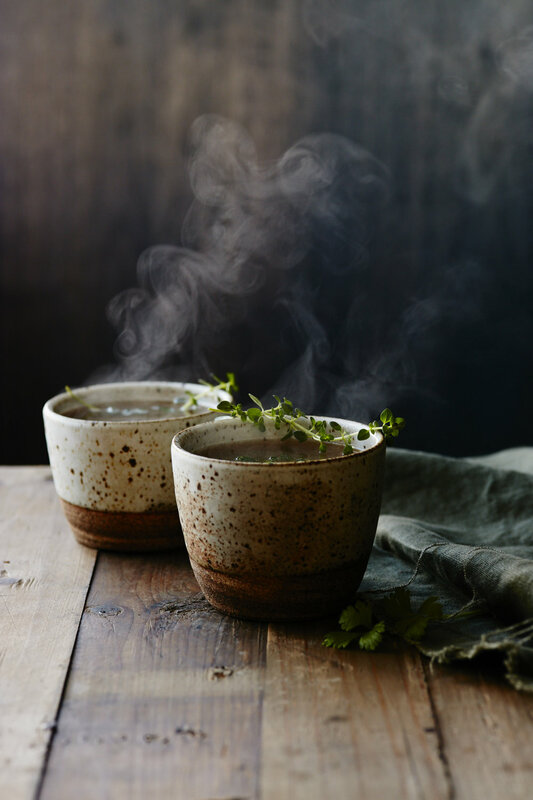 Many people enjoy bone broth as a nourishing tea, sipping it as a bracing, warm tonic throughout the day. Whether you’re under the weather or just looking for an imune boost, this is a great go-to broth. Here I combine burdock root with shitake mushrooms, ginger, and garlic to create a delicious earthy broth that’s full of antiviral, antimicrobial, and anti-inflammatory goodness. 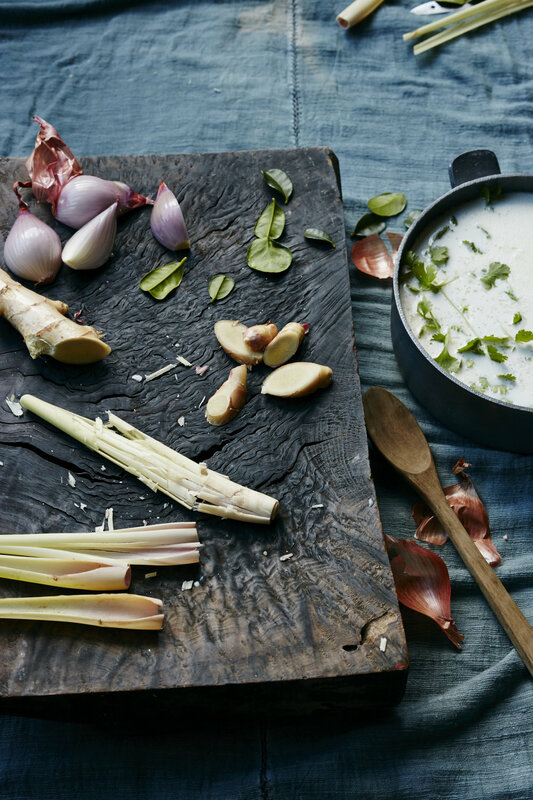 This is like taking your tastebuds on a trip to Thailand—infusing Magic Mineral Broth or, if you prefer, chicken broth, with lemongrass, ginger, shallots, kaffir lime leaves, and coconut milk. The taste is both bright and remarkably comforting. EVEN THE SMALLEST GESTURE OF HUMAN CONTACT AND THE SENSE OF COMMUNITY—NO MATTER HOW BIG OR SMALL—CAN BE INCREDIBLY HEALING. IF THE INTENTION IS THERE, HEALING CAN HAPPEN IN SUCH POSITIVE WAYS EVEN IN SUCH SHORT AMOUNTS OF TIME. Older PostThe flavors and superpowers of garlic!